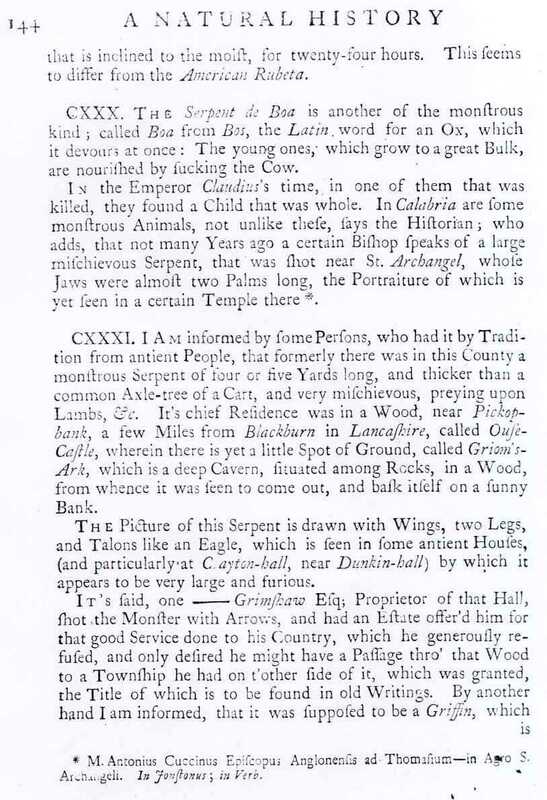 An interesting folk tale related to Grimshaw family history, no doubt based at least in part on a real event, was recorded by Charles Owen in a 1742 publication1. This tale relates the slaying of a large snake by a Grimshaw during medieval times. There has been some confusion about the relationship of this tale to the Grimshaw surname. Considerable confusion also exists on a possible connection of the serpent tale to the Grimshaw coat of arms. Griffin Derived from the Snake? Where are Pickup Bank, Ouse Castle and Griom’s (or Griffin’s) Ark? Why “Ooze” and Why “Castle”? Summary What Really Happened in Ooze Castle Wood? cxxxi. I am informed by some persons, who had it by tradition from ancient people, that formerly there was in this country a monstrous serpent of four or five yards long, and thicker than a common axle-tree of a cart, and very mischievous, preying upon lambs, etc. Its chief residence was in a wood near Pickup Bank, a few miles from Blackburn in Lancashire called Ouse Castle, where there is yet a little spot of ground called Grioms Ark, which is a deep cavern, situated among rocks in a wood, from whence it was seen to come out and bask itself on a sunny bank. The picture of this serpent is drawn with wings, two legs, and talons like an eagle, which is in some ancient houses (and particularly at Clayton Hall near Dunkinhall) by which it appears to be very large and furious. It is said one ____ Grimshaw, Esq., proprietor of that hall, shot the monster with arrows, and had an estate offered him for that good service done to his country, which he refused, and only desired that he might have a passage through that wood to a township he had on tother side of it, which was granted, the title to which is found in ancient writings. By another hand I am informed, that it was supposed to be a griffin, which is a bird of prey, and of the eagle kind, which, I take to be the Ossifrage of Moses, and mentioned in Levit. xi. There is also a fabulous griffin, represented with four legs, wings, and a beak; the upper part of an eagle, and the lower a lion. They conjecture it to watch over golden mines and hidden treasures. This bird was consecrated to the sun, therefore the chariot of the sun was represented as drawn by a set of griffins. This poetic griffin is frequently seen in ancient medals, and is still bore in coat-armour. The ancient and honourable family of the Guillims blazons it rampant, alleging any very fierce animal may be so blazoned as well as a lion. It is observable that in the front of Clayton Hall are two figures drawn in plaster in the form of a coat of arms: on the right side of the escutchion is a figure with wings, four feet and a tail twisted in the form of a serpent. The like figure is drawn in plaster in several ancient houses in that neighbourhood, which go under the name of the Griffins Picture, and the sign is used at Public Houses. There is a place in that wood called the Griffins Ark. N.B. This seems to carry some probability with it, since eagles are voracious creatures, and very destructive to fawns and lambs, especially the black eagle, which is of a lesser size than the other. ” on the second image. Does the Name Grimshaw Mean “Snake in the Woods?” Is the Grimshaw Griffin Derived from the Snake? This interpretation is untenable, however, because the chap who killed the snake was already named Grimshaw, and he was already living at Clayton Hall. And, of course, the Grimshaws did not move to Clayton-le-Moors until about 1345, when the name was probably already more than 300 years old. The Viking origins of the Grimshaw surname is described in a companion webpage. The earliest recorded Grimshaw family (also described on a companion webpage) was headed by Walter, who was living about 1250. There are other lines of evidence indicating that the name may even go well before that date. ” Like the false inference of “Grimshaw” from “snake in Ooze Castle Wood”, this connection between the griffin and the snake has been a source of confusion ever since. Where are Pickup Bank, Ooze Castle Wood, and Griom’s (or Griffin’s) Ark? Pickup Bank is the long, steep hill located northeast of the Grimshawlocation in Eccleshill. The hill bears the name Yate Bank to the southeast of Pickup Bank; the boundary between Yate and Pickup Bank is at a small tributary to Grimshaw Brook called Means Brook. Ooze Castle Wood is located near the south margin of a reservoir behind a dam on Means Brook, not far from Belthorn. Maps showing the location of the reservoir in relation to Belthorn and the Grimshaw location are shown below. Smaller scale map showing the reservoir (just east of the name “Waterside”) in relation to the paper mill at the Grimshaw location and to Belthorn. Larger scale map showing the reservoir in more detail. Note Belthorn to the north and Shooters Hill just south of the reservoir. Note also the reference to “Yate and Pickup Bank Cp (Township)”. The paper mill at the Grimshaw location appears on the left edge of the map. Grimshaw Farm, which is near the paper mill, is shown below. Belthorn is also shown in the distance, up Pickup Bank. Grimshaw Farm and Pickup Bank. 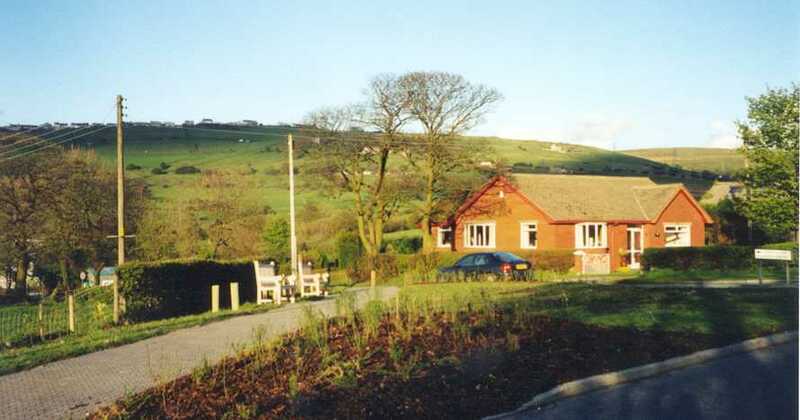 Northeast view, with the farmhouse (described on companion webpage) in the foreground and Pickup Bank, the hill in the background. The community of Belthorn can be seen on the horizon at the top of Pickup Bank. Photo taken April 1999. Ooze Castle Wood is located along Means Brook, about halfway up Yate & Pickup Bank. The wood is approximately a mile southeast of the Grimshaw location (see the Six-Inch Map.) 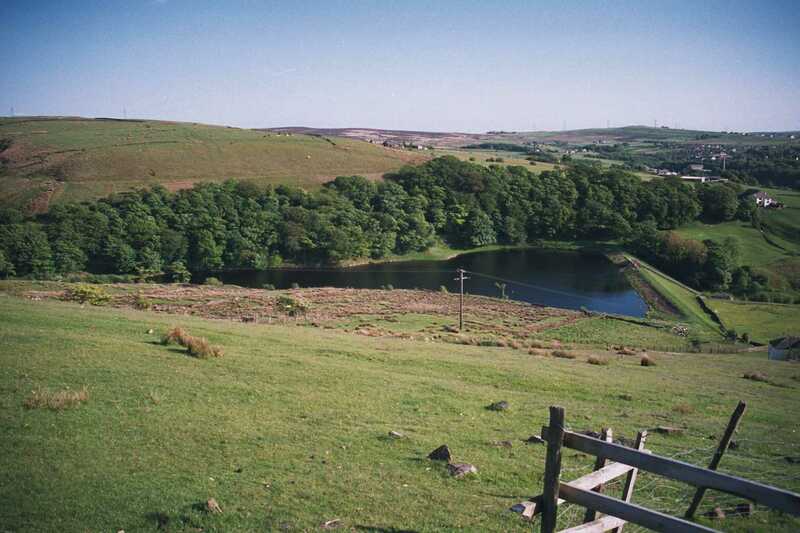 The photo below shows Ooze Castle Wood with the small dam and reservoir just below it. This dam was constructed on Means Brook sometime in the 1800s. The dam can be seen just east of Waterside on the current Ordnance Surveymap of the area. Ooze Castle Wood is not named on current maps of the Eccleshill and Yate & Pickup Bank area, but it has been identified on the 1846 Ordnance Survey “Six-Inch” map7 that is described on a companion webpage. Ooze Castle Wood, on the south bank of Means Brook on Yate & Pickup Bank (southward view). The rock crevice that may be Griom’s Ark is in the wood above the bushes in the foreground (left 1/3 of photo.) Shooter’s Hill forms the horizon on the left half of the photo. Photo taken May 2000. The view in the figure is to the south and includes Hoddleston on the right and Shooter’s Hill on the left. As noted, Means Brook (and its tributary, Tinkler Brook) comprise the boundary between Yate Bank (to the north) and Pickup Bank (to the south). The geology of the site, described on another webpage, is important to understanding several aspects of the location. A brief field survey of Ooze Castle Wood in May 2000 resulted in identification of a potential candidate for Griom’s Ark. It is shown below. It is unknown if this crevice is, in reality, the original Ark as described in Owen’s 1742 article, but it was the best candidate identifiable in the time available. It is in the wood about 1/2 to 2/3 of the way up the reservoir from the dam. A potential candidate for Griom’s Ark as described in Owen’s 1742 article on the “Grimshaw Serpent”. The opening is in Ooze Castle Wood and is a crevice in a sandstone block that is part of a slump (earth movement) on the bank of Means Brook. The author is included for scale. Photo taken May 2000. As noted on the webpage on the geology of the area, the Yate & Pickup Bank area is prone to unstable slopes and “mass movement” of earth material where steep slopes have developed. Ooze Castle Wood is growing on an exposure of thick sandstone bedrock that forms a steep slope (nearly vertical cliffs in some parts.) 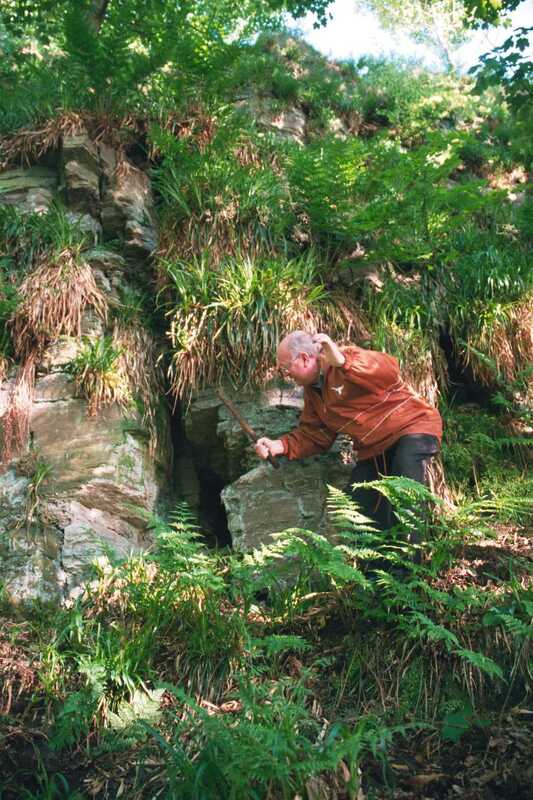 At Griom’s Ark, a block of this sandstone has become detached from the bedrock cliff face and is very slowly sliding down the slope towards the brook. A vertical fracture in the block has experienced “differential movement” (the sandstone on one side has slid a few inches ahead of the other side.) As a result, the fracture has opened somewhat to form a void. Weathering and erosion of the sandstone on either side of the fracture have further enlarged the void to form the crevice. The aerial photos below show the approximate location of the Griom’s Ark candidate in Ooze Castle Wood. 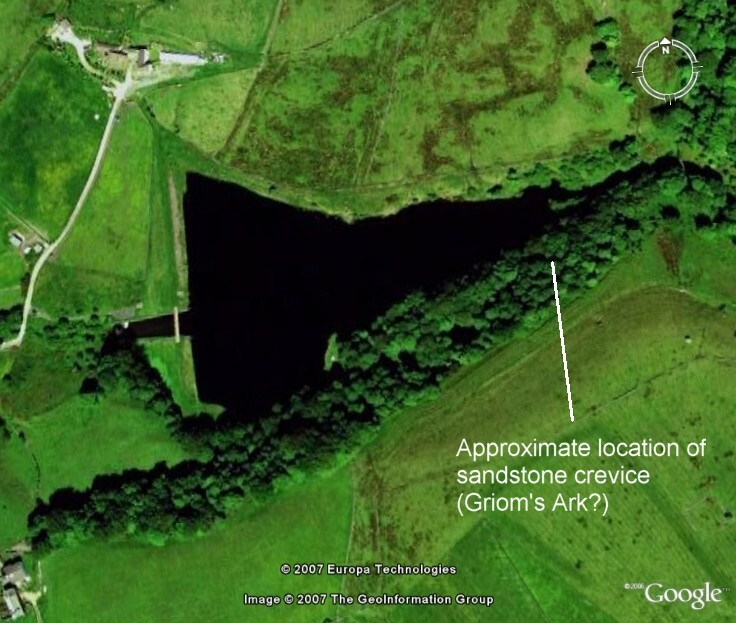 Google Earth Image of reservoir on Means Brook, with Ooze Castle Wood on the south size of the reservoir. The approximate location of the sandstone crevice that may be a candidate for Griom’s Ark is also shown. An even clearer photo was obtained from “Bing” in July 2009 and is shown below. How did Ooze Castle Wood get its name? Starting first with the “ooze” part, the soil in the wood is quite wet because of many seeps and small springs. Rainfall in the uplands (Shooter’s Hill at this location) soaks into the ground and migrates downward through the glacial drift until it encounters bedrock. The bedrock in this area consists of relative impermeable shales (and occasional sandstone beds) of the coal-bearing strata of this region (Lancashire Coalfields). Because it cannot seep further down, the groundwater then migrates laterally and emerges on the hillsides as small seeps and springflow. Not only does this seepage trigger (or perpetuate) the slumps and other mass movement, it keeps the ground in a perennially wet (or oozy) condition. A hike through Ooze Castle Wood readily verifies the wet, oozy condition of the soil. What about the “castle” part of the Ooze Castle Wood name? Perhaps the superstitious occupants of this region imagined seeing the ramparts of a castle in the sandstone cliffs that occur in the wood. One of the effects of slumps and other mass movements is that many of the trees have become tilted and curved. This condition is frequently found in areas of active slumps, because the moving earth causes the trees to tilt, and they become curved as they naturally try to return to vertical as they seek the concentration of sunlight directly overhead. The tilted and curved trees, combined with the oozy or swampy conditions may have given an “eerie” or “spooky” feeling to some of the inhabitants in centuries past. The perception of Ooze Castle Wood to superstitious persons as a mysterious or evil place may, in fact, have had something to do with the origin of the serpent tale. As noted above, there was a strong belief in witches and other supernatural forces in medieval England – in fact seven individuals from the Pendle Hill area just 10 miles north of Blackburn were hanged for witchcraft in 1612. The serpent-killing incident, if true, would have happened sometime between 1350 and 1613. According to E. Eckwalls3Place Names the name Grimshaw is derived from Grima = a spectre, and shaw = a wood, and means “haunted grove.” He mentions another Grimshaw in Cliviger. Trappes-Lomax then quotes a portion of the excerpt from Owens work. By this juxtaposition he seems to lead the unsuspecting to conclude (wrongly) that the snake is the spectre in Eckwalls “haunted grove.” Interestingly, Trappes-Lomax also leaves out most of the part of Owens excerpt that indicates that the monster might be a griffin rather than a snake. LI: Lancashire Inquests, Extents, and Feudal Aids. Ed. W. Farrer. Record Soc. xlviii, liv. LAR: Lancashire Assize Rolls. Ed. Col. John Parker. Record Soc. xlvii, xlix. But Eckwall doesnt explain why the presence of a Grimshaw in Cliviger (which is about 11 miles northeast of Eccleshill, just south of Burnley) would preclude the name from being of Old Norse (i.e., Viking) origin. Eckwall gives no basis to believe that the Cliviger Grimshaw is not derived from the Grimshaws of Eccleshill and Clayton-le-Moors. Therefore, there appears to be no reason at this time not to accept Rogers explanation of the Viking origins of the Grimshaw place name and, thence, family name. The Grimshaw family are still commemorated in Huncoat by the sign of the Griffins Head, the crest of the Grimshaws. 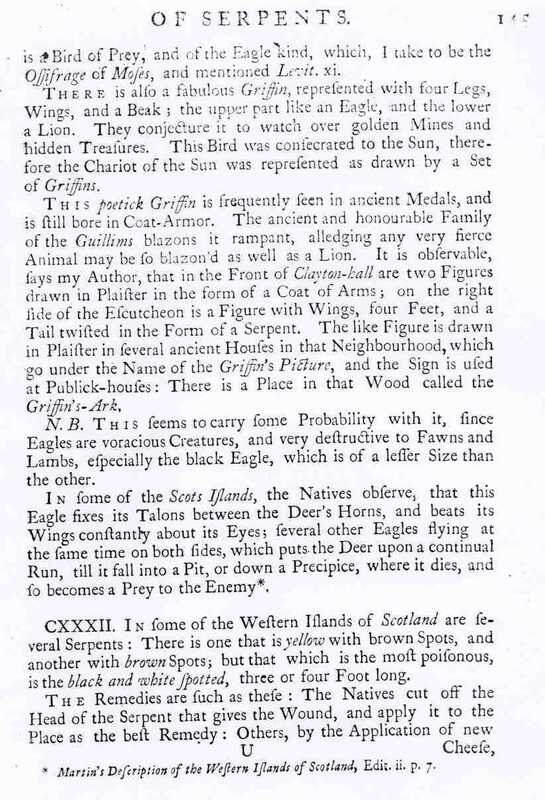 A Natural History of 1742 gives an account of the griffin which appears as the arms of the Grimshaws. This monster was stated to haunt a wood near Pickup Bank called Ouse Castle, in which is a cavern anciently known as “Grioms” or “Grims Ark.” It was stated that a member of the Grimshaw family valiantly went forth to encounter the monster, and succeeded in shooting it with arrows. For this service he had an estate offered him, but refused, only desiring that he might have right of passage through that wood to a neighbouring township on the other side. His wish was granted, and the title is declared to be found in ancient writings. Although the story is only legendary, it supplies a solution to the arms borne by the Grimshaw family. Ainsworth was clearly “taken in” by the false connection set forth by Owens. Huncoat is a former manor located about 1-1/2 miles southeast of Clayton Hall. Ainsworth also has his own interesting inconsistencies  for example, the reference to the griffin as a head and as being in the crest (the original coat of arms had two lions’ heads in the crest) rather that a full griffin in the coat of arms. Note also that the monster is referred to only as a griffin, and no reference is made to a serpent or snake as is clearly made in Owens original work. Where Trappes-Lomax “conveniently” left out reference to the griffin, Ainsworth did so for the serpent! A Walter de Grimshaw is reported by Whitaker6 (v. II, p. 95-98) to have been the warden of a house for those afflicted with leprosy. The location of the leper house was at Edisford, just across the Ribble River (to the west) from Clitheroe, about 11 miles northeast of Eccleshill. It is not known if this Walter, who died about 1316-17, is the Walter who started the earliest recorded Grimshaw family in Eccleshill. Whitaker provided a summary of the history of the Edisford Hall, including the role of Walter de Grimshaw as warden. He also relates the presence of an artifact with a griffin on it at the Hall. The significance of a griffin artifact atEdisford is described on a companion webpage. In summary, this artifact indicates that the Grimshaws may have been using a griffin icon before 1316-17, and well before the Eccleshill Grimshaws moved to Clayton-le-Moors in about 1350 (the earliest possible date for the snake-killing). Summary – What Really Happened in Ooze Castle Wood? Undoubtedly, an event occurred which somehow gave rise to the connection of the snake to the Grimshaw coat of arms with its prominent mythological griffin and, subsequently, to Owens story. The event probably happened when the Grimshaw from Clayton Hall was making a trip through Pickup Bank to Eccleshill, where the Grimshaws still had land holdings (the “township he had on tother side of it.”). Ooze Castle Wood is not on the direct path from Clayton Hall to Grimshaw in Eccleshill, but neither is it very far from it. A community-minded Grimshaw with bow-and-arrow skills would not have had to divert very far from his route in order to do the good deed, especially if it would assure safe passage in the future! Although they make for an intriguing family folk tale, both the connection of the snake in the woods to the Grimshaw surname, and the connection of the snake to the griffin in the Grimshaw coat of arms, appear to be misguided, and (as noted above) a source of confusion. Why were these (apparently) false connections made? One hypothesis is that it was because of the “spooky” environment of Ooze Castle Wood and the superstitious character of medieval England. Suffice it to say that there was a strong belief in witches and other supernatural forces during the timeframe of the snake-killing. In fact, seven individuals from the Pendle Hill area just 10 miles north of Blackburn werehanged for witchcraft in 1612. The serpent-killing incident, if it occurred at all, would have happened sometime between 1350 and 1613. Perhaps it will be impossible to solve the mystery completely. But, one thing we can say for certain — if the creature existed at all, it was more likely to have been a big snake than a griffin! 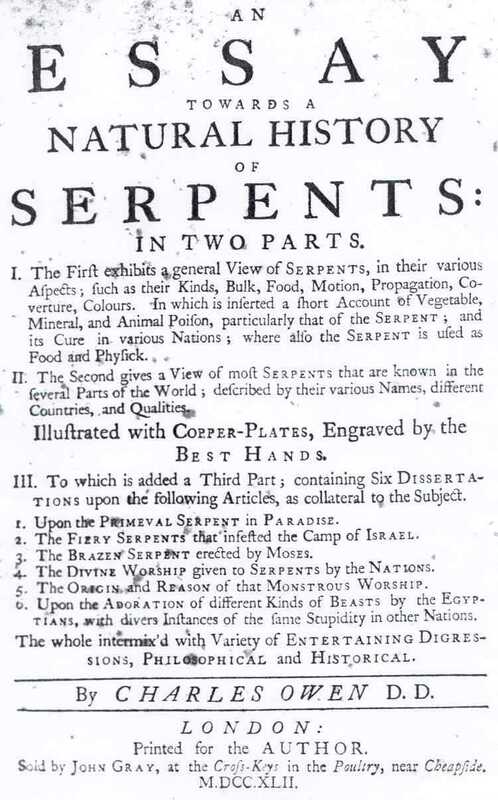 1Owen, Charles, 1742, An Essay Towards a Natural History of Serpents in Two Parts: London, Printed for the Author, Sold by John Gray, at the Cross-Keys in the Poultry, near Cheapside, 240 p.
2Trappes-Lomax, Richard, 1926, A History of the Township and Manor of Clayton-le-Moors, County Lancaster: Chetham Society, Second Series, v. 85, 175 p.
3Eckwall, Eilert, 1922, The Place-Names of Lancashire: Chetham Society, Second Series, v. 81, p. 76. 4Rogers, K.H., 1991, Vikings & Surnames: York, England, William Sessions Limited, p. 15-16. 5Ainsworth, Richard, 1932, History and Associations of Altham and Huncoat: Accrington, Wardleworth Ltd. Printers, unk p.
6Whitaker, Thomas Dunham, 1872, An History of the Original Parish of Whalley, and Honor of Clitheroe (Revised and enlarged by John G. Nichols and Ponsonby A. Lyons): London, George Routledge and Sons, 4th Edition; v. I, 362 p.; v. II, 622 p. Earlier editions were published in 1800, 1806, and 1825. Webpage posted July 2000. Updated March 2001. Updated April 2007 with addition of Google Earth image of Ooze Castle Wood.Updated September 2009 with addition of photo from “Bing”.